Hi y'all! My name is Jen - I blog over at Food, Love, and Life. I happen to be sorority sisters with the fabulous Meghan, and am guest posting while she is off having fun in the sun in the Florida Keys! So instead of a cute outfit, I bring you chocolate. Don't hate me! By the way, the chocolate just so happens to be dark chocolate mixed with sinfully salty and sweet almond butter to make a grown up Reese's PB cup. That's right. No sharing allowed. You'll thank me later. As a kid I was constantly reaching for the peanut butter and chocolate mixture when my sweet tooth wouldn't stop aching for some treats. 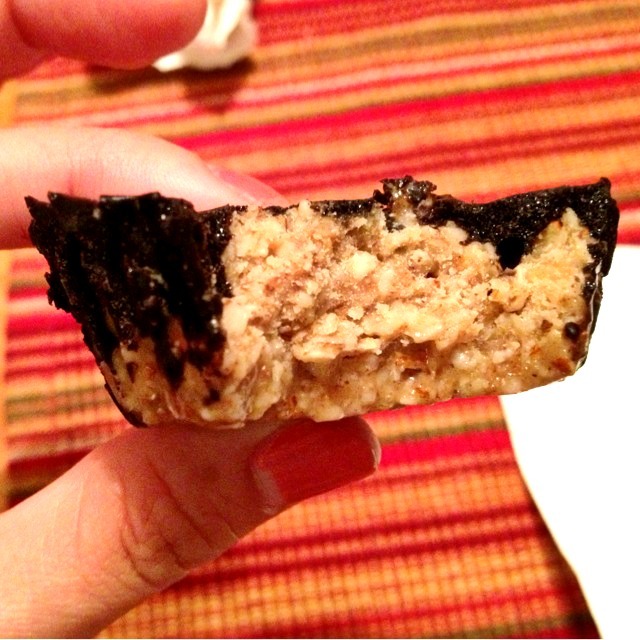 I loved to mix peanut butter and chocolate sauce into vanilla ice-cream, absolutely adored Reese's Pieces, ate my weight in Reese's Eggs & Pumpkins during their respective holidays, and slathered peanut butter onto my Oreos (still a favorite of mine - YUM!). I don't know what it is about that magical combination of salty and sweet but I couldn't, and still can't, get enough! 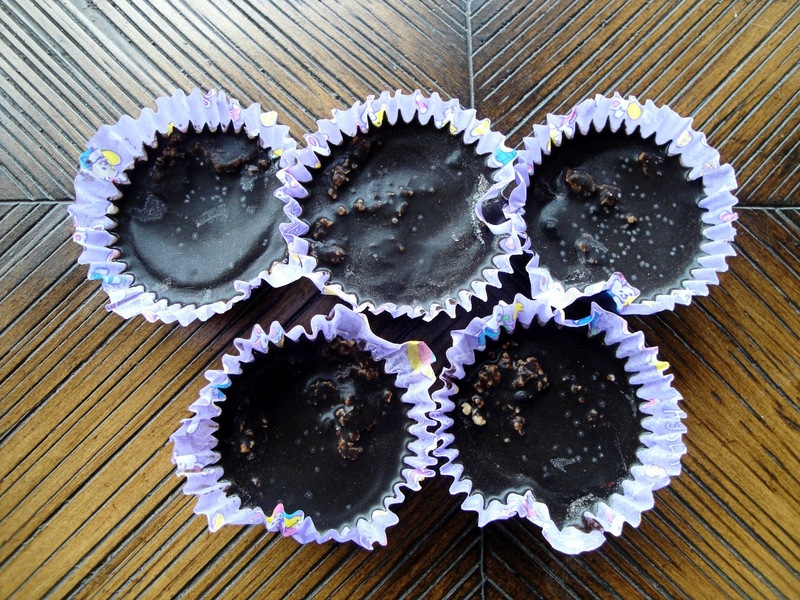 So, when I saw this recipe on my favorite vegan blog, Oh She Glows, I knew I had to try it! Her blog is always my go-to when I feel like making a creative and yummy vegan dish. These are best kept in the freezer because the chocolate layer starts to melt onto your fingertips as soon as they are out. But.... that's okay. That just means you have to eat them more quickly. No problem there! Add almonds and oats into a high-speed blender and blend on high until a flour forms. Dump into a large bowl and break up any clumps with your fingers. Add the nut butter, coconut oil, agave (or maple syrup), cinnamon, vanilla and salt into the bowl. Stir until thoroughly combined. The dough should be fairly sticky like cookie dough. Line a regular muffin tin with paper liners. 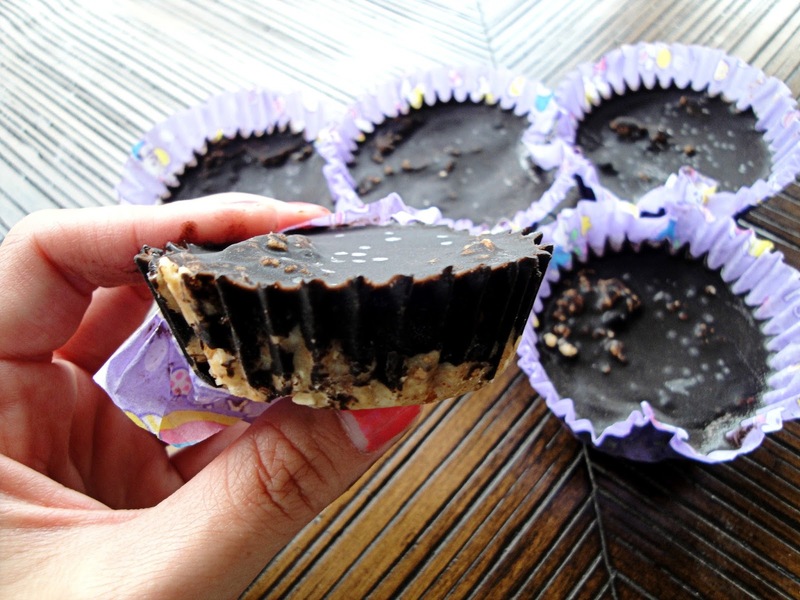 Portion the dough into each muffin cup and press down until even and smooth. To make chocolate sauce: Whisk together the coconut oil, sweetner, cocoa powder, and salt until no clumps remain. Spoon the sauce over top each of the cups, distributing evenly. Place in the freezer in a flat area for 30-45 minutes, until firm. These are best consumed straight from the freezer. These look delicious! Chocolate and PB is the best flavor combination; dark chocolate only makes it better.